We are very people orientated at LTL Mandarin School and that extends beyond our staff, students and teachers! We enjoy regular interaction with anyone who loves Chinese and that includes our Social Media channels and of course our email subscribers. We provide regular content to our Mandarin loving subscribers and you can be a part of our ever growing community by simply entering your email below. Our emails are always fresh and never the same. Find out what’s going on in Beijing and Shanghai. Check out our most popular and recent blog posts. Find out our newest, exciting programs for the coming months. Find out what’s going on with our students at LTL. Please feel free to sign up to the relevant list below, or even all three! 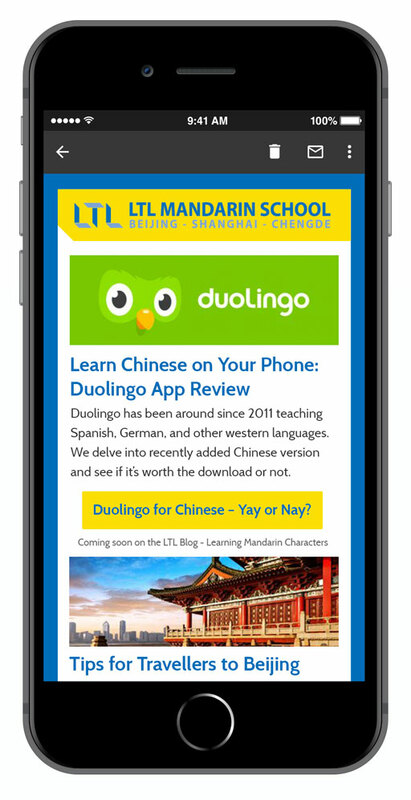 If you are a student, or a wannabe Mandarin learner then you can get your hands on a tonne of free learning resources whether it be from our newsletter, blog or other freebies online. We also give you a heads up on any useful offers, new bars and restaurants amongst a host of other useful things in Shanghai, Beijing and Chengde. Stay ahead of the game and get signed up to our LTL Student Newsletter list. If you are a teacher and want to be kept abreast of any of the latest trends and information you are welcome to sign up. The latest teaching resources and materials, news from the teaching industry and opportunities at LTL will be listed in our Teacher Newsletter. We’ll also put you in the direction of any useful blog posts regarding the industry and our teachers also.